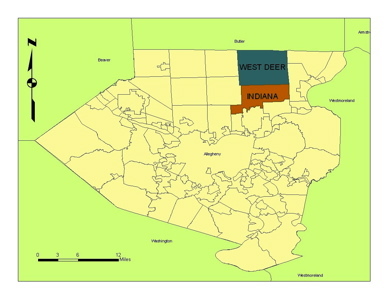 The Deer Creek Drainage Basin Authority (DCDBA) serves primarily the residents of West Deer and Indiana Townships, but also conveys sewage from areas of Richland , Hampton and Harmar Townships. DCDBA operates and maintains a conveyance sewer system for the purpose of transporting waste water from its customers in West Deer, Indiana, Richland, and Hampton Townships. The DCDBA conveyance system consists of approximately 125 miles of mainline sanitary sewers, five pump stations, and 4,000 manholes. The system conveys waste-water to multiple treatment facilities including Allegheny Valley Joint Sewage Authority in Harmar, Upper Allegheny Joint Sewage Authority in Tarentum, and Alcosan in Pittsburgh. Movement of waste water through the system is primarily by gravity flow from the residential and commercial customers sites to the outlying pump stations (Bigler, Hampshire, Culmerville, and Deer Run Pump Stations). The flow continues from the (4) pump stations and converges at the Rich Hill Pump Station, where flow is transferred by three alternating centripetal-pumps operating at 1,500 gallons per minute into the force main. The force main pipe carries the waste water the final distance to the Allegheny Valley Joint Sewage Treatment Plant. On average, approximately 2 million gallons per day of waste water is transported through the system to Allegheny Valley for treatment. Additional flows are transported via gravity sewers to the Upper Allegheny Joint Sewage Authority and Alcosan. Currently, both Indiana and West Deer Townships have Township Planning Commissions, which provide municipal-level reviews. Population data provided by the Pennsylvania State Data Center based on data from the 1990 census projects a gradual decline in the population of the area over the course of the planning period; however, it is generally recognized that a developed central sewer system will generate growth. This fact coupled with the availability of land suggests that population may grow in the area. In 1981 DCDBA customers totaled 2,975. In 1990 DCDBA customers totaled 4,526. In 2011 DCDBA customers totaled 6,059.